Eleanor Young is not a woman to be trifled with. Just ask anyone who's ever mistaken her quiet demeanour for passivity. Eleanor's son, Nick, is the apple of her eye. But Nick has grown weary of the burden that comes with being the heir apparent to the Young family's sprawling business empire in Singapore. Though Nick's treated like a rock star in his home country, he's managed to live a bit more under the radar in New York City for the last several years. There, he met and fell in love with Rachel Chu, an economics professor at Columbia University and daughter of a hardworking single mum. Somehow, Rachel doesn't know of Nick's ultra-rich background. To her, Nick's just a polite, attractive and attentive boyfriend. Rachel's thrilled that Nick has invited her to Singapore to attend his best friend Colin's wedding, where Nick will be the best man. Now she'll finally get a chance to meet his family. Rachel's first clue that Nick hasn't quite told her everything about himself comes when they get on the plane, and get ushered into a private suite. Nick tries to explain. "Yes, my family has money," he says modestly. "I've always thought of it as theirs, not mine." Although Nick sought to distance himself from his rich relatives, his family has all kinds of plans about his return to Singapore. Plans that—as Rachel soon discovers—don't include him spending the rest of his life with a "poor" Chinese-American girlfriend. But slowly, Rachel begins to win over key members of Nick's "crazy rich Asian" family, perhaps even beginning to thaw the icy heart of Eleanor Young herself. Despite the complex cultural world that Rachel finds herself in, the core story here is straightforward: Nick and Rachel's attempts to earn Eleanor's blessing. But Eleanor is no easy sell. The Young family lives and breathes among the hyper-rich. Having the family's heir apparent marry a woman who's a commoner wouldn't do at all. Still, Eleanor is not a two-dimensional villain; she is known to put her family's needs above her own. In this regard, the film offers an incisive critique of American culture. Eleanor shows disdain for a society in which an individual's passion is seen as more important than the needs of a family. lNick, meanwhile, demonstrates his own character by proving to Rachel that his relationship with her matters more to him than his family's money. Rachel's mother, Kerry Chu, doesn't have the wealth of Nick's family but she earns a decent living running a small business. And she stands up for Rachel when the chips are down. Other colorful characters play encouraging roles in this drama. Rachel's college roommate, Goh Peik Lin, encourages and supports Rachel at various points. Rachel also develops a friendship with Nick's cousin Astrid; the two of them console each other in hard moments they both face. Eleanor's Christian faith is apparent in the movie, and she forbids Nick and Rachel from sharing a room together in her house during their visit. Elsewhere, we hear a couple of passing references to Asian spiritual beliefs. Rachel's mother, Kerry Chu, encourages her to wear a red dress when she meets Nick's mother because that colour is considered good luck. Rachel and Nick kiss repeatedly, and they're shown in bed together on a couple of occasions as well. Another of Nick's cousins, Allister Cheng, is a movie director. His girlfriend, actress Kitty Pong, wears revealing clothing. Later, she appears in a compromising position with another lover (whose pants are down, but whose shirt mostly covers his backside). Astrid's husband, Michael, is shown in the shower, where we see his torso. The couple kisses and is shown in bed together. We learn that one married character is having an affair. We also hear someone had an affair that led to an illegitimate child. Oliver, who's gay, calls himself "the rainbow sheep of the family." There is a story about how someone's ex-husband used to be physically abusive. At a bachelorette party, women who are jealous of Rachel put a large, dead, bloody fish in her bed to scare her away from Nick, with the words, "Catch this you gold-digging b--ch." One f-word, one s-word. We see the profane acronyms "OMFG" and "WTF" in texts. There are several uses of "a--", "a--hole", "b--ch" and "b--tard." Characters imbibe various alcoholic beverages in the movie. Colin's bachelor party takes place on a tanker ship turned dance club, and alcohol flows freely there. Eleanor is coolly polite to Rachel for a while. But when she has an opportunity to do so, she leaves no doubt as to where she stands, cruelly telling Rachel, "You will never be enough." There are several racist comments. A rich Chinese woman tells her picky children, "There's children starving in America!" Someone is said to be like an "Asian Ellen." Rachel is described as being a "banana," an ethnically Asian woman who's "yellow on the outside but white on the inside." Crazy Rich Asians is essentially an updated version of Cinderella. Only this time around, it's the heroine who doesn't know the identity of the man she's fallen in love with. And finding out proves a pretty traumatic experience for everyone involved. But as with most fairy tales, things do work out in the end. In this version, we're invited to ponder the differences between two contrasting cultures when it comes to matters of the heart: the Asian values of loyalty and family, and the American values of individuality and passion. Both sets of ideals have their strengths and weaknesses. 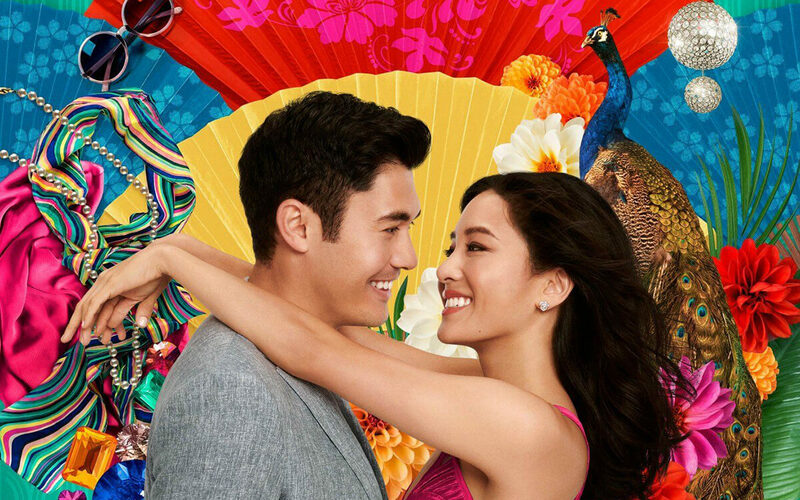 While Crazy Rich Asians seems to be hitting all the right notes with its funny, feel-good factor, its coarse language and sexual innuendoes may tarnish the PG-13 romcom's broad appeal.